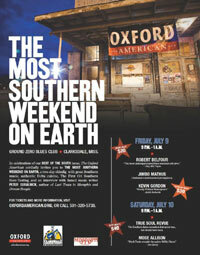 The Oxford American, the South's leading literary and cultural magazine, will present "The Most Southern Weekend on Earth," a two-day celebration of Southern music, literature, food, and drink, in Clarksdale, Miss. on July 9th and 10th. "We are thrilled to celebrate the release of our 2010 Best of the South issue with these events in the heart of the Mississippi Delta," said Warwick Sabin, publisher of The Oxford American. "James C. Cobb famously called this area 'The Most Southern Place on Earth,' and Clarksdale is the perfect setting to enjoy fun, fellowship, and the best of Southern culture." The weekend events are highlighted by two blockbuster nights of music at Ground Zero Blues Club (Blues Alley) that are an amazing value. Located in the heart of historic downtown Clarksdale, Ground Zero Blues Club is owned by local attorney and businessman Bill Luckett, corporate entertainment producer Howard Stovall, and Academy Award-winning actor Morgan Freeman, and is dedicated to showcasing the best of today's Delta Blues musicians. On Friday, July 9, starting at 8 p.m., the lineup will include legendary blues musician Robert Belfour, the Clarksdale phenomenon Jimbo Mathus, and the great Nashville songwriter and performer Kevin Gordon. Admission for Friday night only is $20. On Saturday, July 10, starting at 8 p.m., the energetic and exciting True Soul Revue will take the stage, followed by the weekend's headliner, the incomparable Mose Allison. Admission for Saturday night only is $30. A special pass for both shows is available for only $40. Interview with famed music writer Peter Guralnick, author of Sweet Soul Music: Rhythm and Blues and the Southern Dream of Freedom, and Last Train to Memphis: The Rise of Elvis Presley, and largely considered one of the giants of American music history conducted by Marc Smirnoff. Sat. 1:00 pm-2:30 at the Delta Blues Museum. The First OA Independent (Southern) Beer Tasting and Contest, moderated by Daniel Bradford, Publisher of All About Beer Magazine (allaboutbeer.com) Sat. 4:30pm-6:00 at RUST Restaurant. The Mississippi Delta Hot Tamale Trail talk and tasting moderated by Amy Evans Streeter, oral historian of Southern Foodways Alliance (southernfoodways.com) Sat. 11:00am-12:00 at Delta Amuseument Cafe'. Special talks and presentations by OA contributing writers. And more surprises and special guests!